The Cafe's theme this week for texture Tuesday is "Orange"...Seems to me orange is making a come back. When I think of the orange counters my brother put in his house in the 1970s I cringe. Egad. I hope not. Not a lot of orange around here so I looked to the garden and the sky. 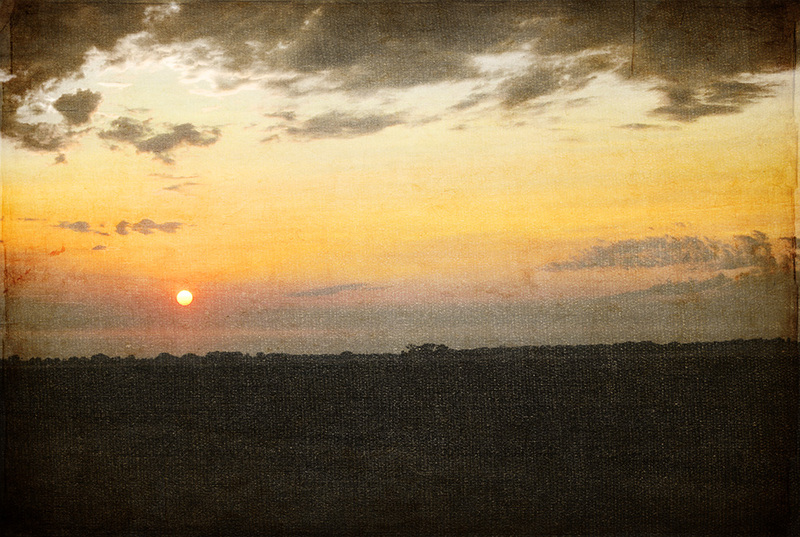 Photo layered with Kim Klassen's"ephemera" texture on soft light. I shot this sunset coming home from Omaha last week and as I was editing it, my six year old was sitting on my lap and said, "That looks once upon a time-ish". And, then she said, "It looks like Jesus is coming to town instead of Santa." I'm also saying Hello today to all of those having tea with Kim at Art in Red Wagons. All of their tea talk has me buying samples here and there to see if I jump on the tea wagon. But, for today, I'm still drinking coffee. I have enjoyed some new flavors of tea though with a couple of my daughters. This cool orange splattered step ladder is in my garden. I have about 5 splattered orange pieces (all from the same sale) that I have just come to love out there and in the barn. Who'd a thought? Orange? Both of the photos were edited with Nelly Nero's shabby suitcase action and a layer of Kim's boutique texture. Say Hello to the tea drinkers here and to the texture lovers here! What a sweet comment from your daughter! Love the textured flowers! Great shots! And a cute joke too. 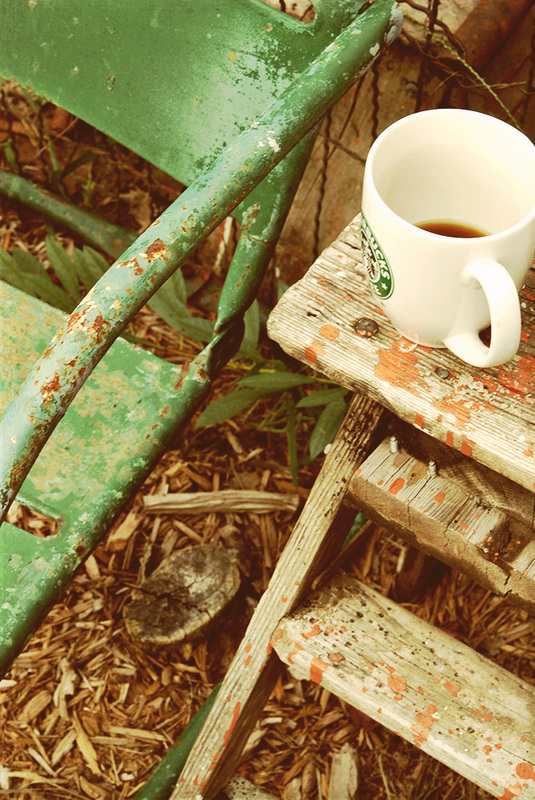 Would love to join you for a cup of coffee over there! your 6 yr old is absolutely precious...but you already know that! 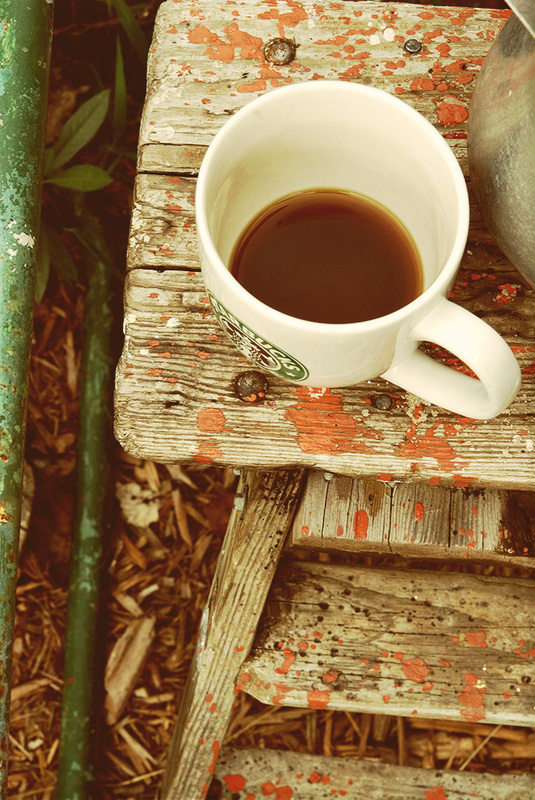 I drink coffee on the weekends ... both tea and coffee are a treat! Each picture is gorgeous! I especially love the orange splattered table. Coffee is my favorite too, but I'm trying to branch out towards some tea! Have a blessed day. Visiting from "Texture Tuesdays". I just love the hints of orange color in the wood. these are all lovely. I especially love the old step ladder. beautiful. I vaguely remember those orange countertops that a girlfriend had in her parents' home. I always hated that color. Then I got exposed to art and decided I at least liked it enough to use it in splashes of color for autumn. Other than that, it reminds me of Halloween. 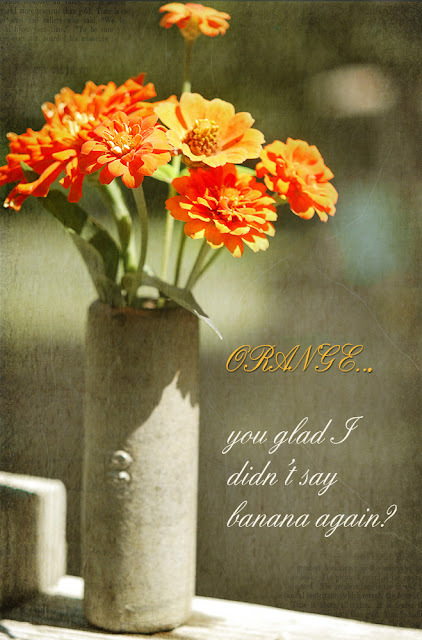 So, ORANGE you glad I didn't say Christmas? Like you, I need to be gently prodded away from the coffee I drink from morning to night. But it is only one day a week for me, so it is fun to play with tea on occasion. Happy Tuesday, even if we are both drinking coffee about now! What a lovely old ladder... I have one similar... or I should say my husband does... He's not ready to let it go yet. I love all the old coffee pots in your banner... I have one very similar! Welcome to Tea Tuesday! Kids say the COOLEST things. I'm glowing with you on that one. I am liking orange these days-- and pea green (two colors I once thought only redheads could wear). Your photos are always impeccable.